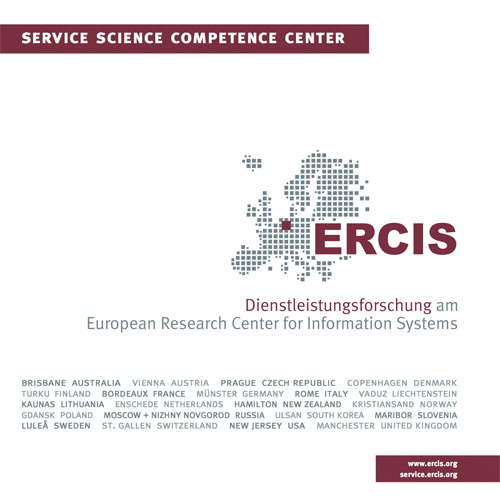 WI 2015 | ERCIS Competence Center "Service Science"
The International Conference on Wirtschaftsinformatik is the most prominent German Conference on Information Systems that is held bi-annually in all odd years. In 2013 the program comprised 106 research presentations, four panels, five tutorials and five keynotes/invited talks. Out of the 415 submissions received for WI2013 in the eleven research tracks this yielded an acceptance rate of 25%. An exhibition, social events and excursions to Amazon, BMW, DHL and Porsche in Leipzig complemented the official program. The ERCIS Service Science Competence Center will be involved at Wi2015 in the track on "Services and Hybrid Value Creation". The track is chaired by Jan Marco Leimeister (University of St. Gallen, Switzerland and University of Kassel, Germany) and Kathrin Möslein (University of Erlangen-Nuremberg, Germany). Daniel Beverungen and Martin Matzner serve as associate editors.